Date of my hike: Christmas Break 2002—the week before Christmas. I hiked the trail with bob, a guy I hiked on the Appalachian Trail with 40 years ago—Bob was a first-timer, but did pretty good, even though (like all first-timers) his pack was a bit heavy. 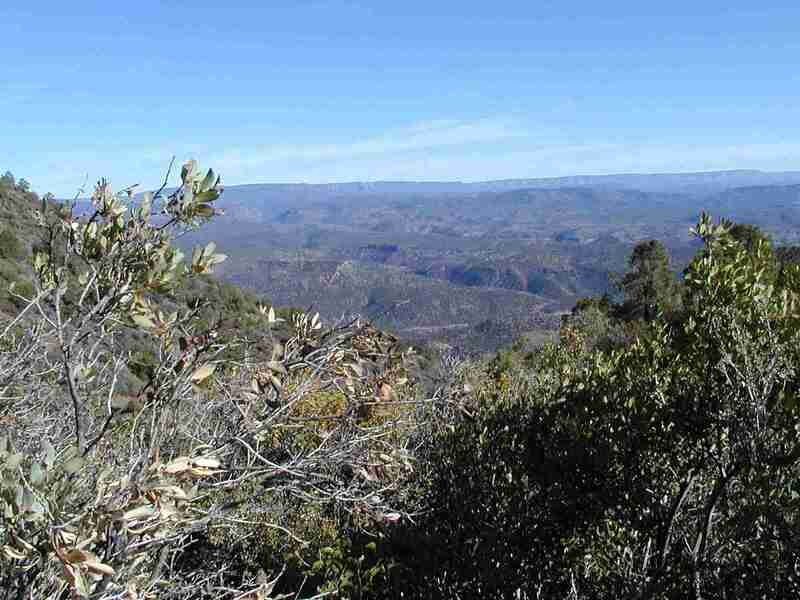 Route: The Arizona Trail through the Mazatal wilderness--Strawberry to Sunflower—sixty of some of the hardest miles of the Arizona Trail, many of these miles are two miles long. Trailway. The footpath is much like the Appalachian Trail though you’ll do more “bush-whacking” on the trail—remember this is a new trail, and not really finished yet. You’ll have to have a map and use it often—many junctions are not marked and if you assume you’ll simply “follow the blazes” you’ll get hopelessly lost. There are lots of rocks in Arizona, and virtually everything that grows has thorns. If you make ten miles a day on the AT, you can probably make a dozen on this trail. If you are a 15er on the AT, this trail may get you 20—but beware, there are some really tough sections. Elevation. 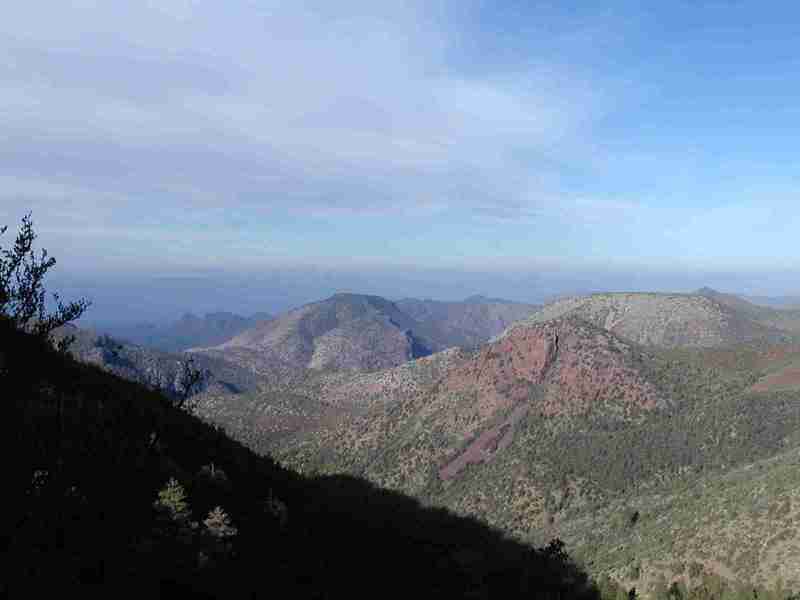 Be ready to walk at 5,000-8,000’ elevations and expect to sometimes climb a couple thousand feet in a morning. This trail is no easy cakewalk. Views. Nice—lots more than the AT, less spectacular than the PCT or CDT. Snakes & Bears. They were sleeping, but there were plenty of bear calling cards on the trail. Mountain lions were still active, but if they saw us, we didn’t see them. Water. In the summer it is a big problem—in December we had water every 4-6-8 miles, twice a day—delightfully cold springs. Sun. Hey, it is Arizona—every day. While the temps dropped to the 30’s at night, they rose in the 50’s every day. Lean-tos. Sorry—this is not the Appalachian Trail. There are plenty of places to camp, but no lean-tos. Humidity. This is Arizona--forget your sweatband. Bring sunglasses instead. Trail marking. HA! Forget it. There are some, but this is a new trail—in some cases hikers used to the Appalachian Trail’s constant blaze-reassurance, this would be considered a “route” more than a trail. Take a map and maybe even a compass. Temperatures. Get ready for blazing hot days in the summer—in fact lots of the trail is not hikable in the summer—but this was a perfect hike for winter… wonderfully crisp nights and warm-but-not-hot days. Couldn’t be a better place for a Christmas break g\hike! Boots. If you have weak ankles you might need them—there are places where the trail would be like walking in the back of a pickup truck fill of baseballs rolling around. However, if you’ve never sprained an ankle, and your dry pack is under a dozen pounds, consider sneakers—I did. Blisters. Same rule as always—keep your feet dry and cool and you can beat them. Expect them in the summer. Re-supply. Sure, but not like the Appalachian Trail. And there is often a ong hitch into town… remember “out west” to cross a road is not to be near a city—sometimes the first store is 50 miles away from the road crossing. Guidebook. The best help is from Dave Hick’s website—he’s an experienced thru-hiker and his online guide is better than most you’d pay for (South-to-north—if you walk south you’ll have to rewrite the guide backwards) You can also check on the Arizona Trail organization that advertises a new guide for actual money—but it wasn’t in print by the time we left. Don’t expect a “data book” like the AT or PCT—not yet, remember this trail is new...it is like hiking the Appalachian Trail in the 1960s. Hope you have a great hike! We did!